Gavi, the Vaccine Alliance (Gavi) and the Global Fund have been collaborating at the program level for many years. Their collaboration will intensify now that the headquarters of both organizations are relocating to the Global Health Campus (GHC) in Geneva. Gavi and the Global Fund are the world’s two largest multilateral health financing mechanisms, together providing over $5 billion a year to scale up access to health services, fight infectious diseases, and save lives. Both organizations are committed to building resilient and sustainable systems for health. While the Global Fund has a broader geographical scope –– currently, 109 countries are eligible to receive support from the Global Fund, and 56 from Gavi –– there is significant overlap between the countries supported by both organizations, especially in Africa. The donor base of Gavi and the Global Fund is also similar. The two organizations have identified five areas – four programmatic and one operational – as having the highest potential for collaboration, illustrated in the figure below. Key areas of collaboration include (1) sharing knowledge, information and lessons learned; (2) coordinating political advocacy at global and country level; (3) aligning programmatic policies, and (4) making joint coordinated investments. Teams across Gavi and the Global Fund regularly share information and expertise. At country level, Gavi’s senior country managers and the Fund’s fund portfolio managers routinely share information. At headquarters, there is continued exchange of information and best practices. For example, the Global Fund was a member of the Steering Committee for Gavi’s Health System & Immunization Strengthening policy review and collaborated closely on Gavi’s review of its fragility policy. The Fund also provided input on the development of Gavi’s Country Engagement Framework, based on experiences with the Fund’s own new funding model. The two organizations share best practices and knowledge on market shaping. Gavi attends the Global Fund’s annual Market Dynamics meeting, while the Fund’s Head of Direct Procurement attends Gavi’s Vaccines Market Dynamics Convening meeting. Gavi and the Global Fund regularly share knowledge and approaches in order to achieve efficiencies in financial management and better manage fiduciary risk. One example of this collaboration is that Gavi has often sought to use the Fund’s local fund agents to conduct and inform its program capacity assessment. 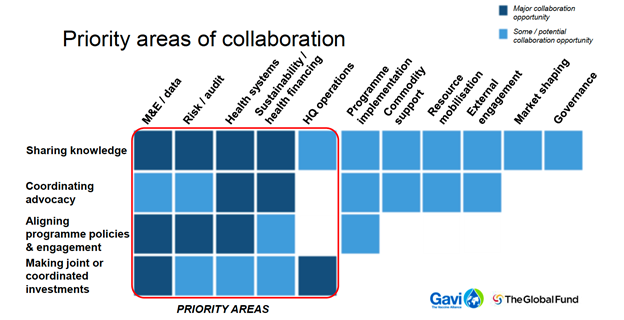 Where opportunities exist, Gavi and the Global Fund also share oversight mechanisms in high-risk countries. For example, the two share fiduciary agents in Congo DR and Madagascar. There is close coordination between the resource mobilization teams of both organizations, and both governance teams work closely together to share information. The Gavi Audit & Investigations Department and the Global Fund OIG have agreed a memorandum of understanding to enable information to be shared confidentially between them. In some collaborations, there are both opportunities and limitations. In 2017, Gavi’s audit team and the Global Fund’s OIG collaborated on an audit of the programs in Zambia to evaluate whether such collaborations could enhance the efficiency and effectiveness of country audits. The teams undertook their audits in the same three-week period, staying at the same hotel, and holding workshops together to share findings. The teams obtained a number of benefits from working together, such as sharing intelligence and communicating certain jointly identified themes to the Ministry of Health. However, they found that – for a variety of reasons – there was insufficient operational overlap between the operating models of the two organizations to enable a joint audit to add value. Gavi and the Global Fund have similar policy priorities. Both seek to shape the global political discourse to ensure that health remains high on the policy agenda and to optimize the global development and health architecture in support of the SDGs. To this end, the two organizations coordinate their global advocacy efforts –– such as working to ensure that G7 and G20 summits explicitly recognize the importance of global health. In implementing countries, Gavi and the Global Fund work together to advocate for greater domestic investment in health and the strengthening of primary healthcare systems. For example, the two organisations are increasingly coordinating missions to countries to enable more effective engagement (e.g. in Afghanistan, Central African Republic, Congo DR, Eritrea, Guinea-Bissau and Niger). Gavi and the Global Fund seek, wherever appropriate, to align their programmatic policies and approaches. This reduces transaction costs for countries, ensures Gavi and Global Fund efforts are mutually reinforcing, and helps to ensure that both organizations are using best practice approaches. The two organizations collaborated closely to develop their respective policies and operational guidelines on topics such as fragility; financing human resources capacity and incentives in implementing countries; and the creation of country teams. There has also been work in a number of countries to harmonize monitoring indicators and to align cost frameworks to reduce the reporting burden for implementers. The Global Fund is also seeking to learn from, and build on, Gavi’s Partners’ Engagement Framework to manage Global Fund–financed technical assistance. In recent years, Gavi and the Global Fund have increasingly coordinated their country-level engagement and investments. This is particularly relevant where countries choose to use the support of both organizations to tackle similar bottlenecks (e.g. to strengthen supply chains) or where both face similar challenges (e.g. low fiduciary management capacity in the same implementing entity). The two organizations have aligned health systems investments in countries such as Burkina Faso, Congo DR, Ethiopia, Gambia, Guinea, Lesotho, Liberia, Malawi, Papua New Guinea, Sierra Leone and Tanzania. This includes joint efforts to strengthen supply chains and data systems, including the roll-out of DHIS2. Gavi participated in the last Global Fund Technical Evaluation Reference Group (TERG) meeting, and the TERG Chair and officials from the Global Fund Secretariat attended Gavi’s last Evaluation Advisory Committee meeting to discuss potential areas of collaboration. The Global Fund has launched prospective country evaluations, which build on aspects of Gavi’s full country evaluations. The two organisations are actively exploring potential synergies and avoiding duplication (e.g. by using the same evaluation partners in Uganda and Mozambique). In March 2018, the Global Fund Secretariat relocated to the new Global Health Campus (GHC) in Geneva, and Gavi is expected to move at the end of June. Together, they will occupy 85% of the space. The other tenants are Unitaid, Stop TB, and Roll Back Malaria. The campus is designed to foster collaboration, enable new ways of working, and inspire innovation. The respective leaderships of Gavi and the Global Fund have agreed to an equal partnership in the GHC. The two organisations are sharing a number of services (e.g., facilities management, security, printing, the IT network and communications). The new offices will facilitate even greater collaboration. As an illustration of the collaboration between the two organizations, the Board paper on which this articles was based was prepared jointly by Gavi and the Global Fund.